It’s well documented that the INSTEON I/O Linc can be used to control a garage door and monitor whether the door is open. 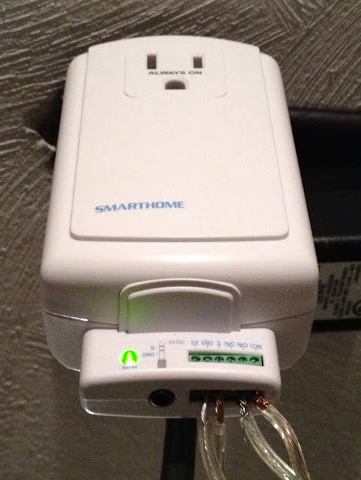 It can even be accessed from a mobile device, making this a highly convenient home automation tool for less than $100. What was far less clear (to me, at least) was exactly how to connect the I/O Linc to the garage door opener. So, what follows is equal parts tutorial and lessons learned. The details will almost certainly vary, so be sure to consult the user manuals for your equipment. To connect my GDO to the I/O Linc, I used a length of old (read: ugly) speaker wire that I had lying around. (I recommend using bell wire or one pair of wires from an RJ-45 cable as they will be a better fit for the I/O Linc terminals.) One wire connects to the Remote/Opener Terminal (#1). The second wire connects to the common terminal (#2) in the center. The button on the wall will also be wired to these terminals. Next, we’ll connect the other end of the new wires to the I/O Linc. The instruction sheet that ships with the I/O Linc is helpful and full of dense information, but it left me scratching my head. There is one very important wrinkle that must be dealt with before we can wire the I/O Linc to the GDO. The I/O Linc ships with its relay in latch mode, which means that when you press the button on the wall, the I/O Linc will close the relay and keep it closed. Most GDOs assume that the relay will close for a brief period (say, two seconds) and then open again. We need to configure the I/O Linc to respect this assumption. Press and hold the “Set” button (on the side of the I/O Linc) until it beeps. Release the button. The I/O Linc is now in linking mode. 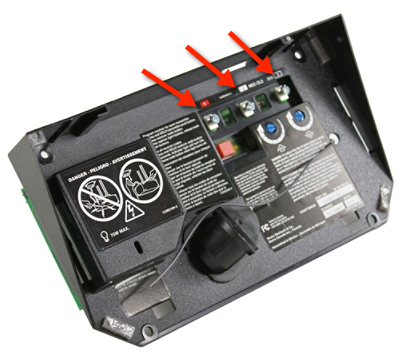 Press and hold the “Set” button (on the side of the I/O Linc) until it beeps. Release the button. The I/O Linc is now in unlinking mode. The other two wires in the photo are for a magnetic garage door sensor. More on that in a moment. When the I/O Linc receives a signal from its controller (a SmartLinc 2412n in my case), its relay closes, and the normally open circuit is closed for a brief moment. This is the very same event that occurs when you press the button on the wall. The GDO responds by opening, closing, or halting the garage door. If you want to monitor whether the door is open or closed, then you’ll need a magnetic door sensor. These are inexpensive (< $5) and easy to install. 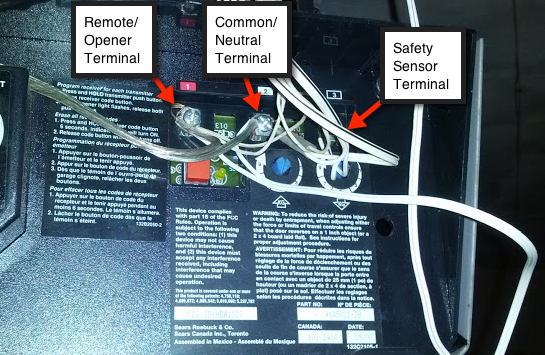 Once the sensor is mounted, connect one wire to the I/O Linc’s “Sense” (S) terminal and the other to “Ground” (GND). When the door is closed, the green Sense light on the I/O Linc will be illuminated. When the door opens, the light will go out. N.B. : If you plan to use the INSTEON mobile app, be advised that the “Status” for the I/O Linc is the status of the relay, not the door. When you open or close the door, the status will briefly change from Off to On and then back. If you want to monitor the open/closed state of the door, you will need a more sophisticated app. For Android devices, MobiLinc is a good option. Controlling and monitoring your garage door opener with INSTEON devices is not complicated, but pulling together the relevant instructions can be frustrating. Makers of garage door openers generally don’t explain how to do one-off installations, and the dense instruction manuals for the other components can be offputting. Hopefully I’ve found a comfortable middle ground with this tutorial. If you follow these steps and find that the steps are incorrect or that your equipment differs from what I’ve described, please leave a comment below. Good luck, be safe, and have fun.